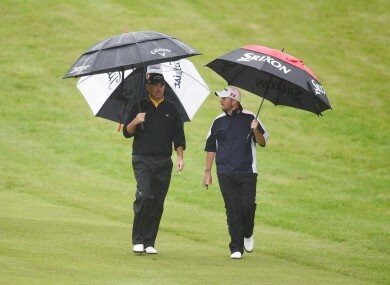 Heavy rain had delayed the start of the third round. The 43-year-old Dane fired a spectacular 67, including seven birdies in the final eight holes and coming home in an incredible 30, to show the rest of the field a clean pair of heels. “I had a terrible start with some poor decisions but I settled myself down and knew I could play this back nine pretty well. I got the momentum and kept it going,” he said. Bjorn, who produced a storming course record 62 on Thursday, suffered a double bogey at the first and then another dropped shot soon after. But after falling back to seven under he turned in a stunning burst of birdies between 11 and 16 to set another record for consecutive birdies. He had a shortish putt on 17 for another but it just grazed the outside of the hole to leave the Dane a little frustrated. Yet he pulled himself together to finish in style with a seventh birdie on the back nine and complete another memorable day. Now, not many would bet against Bjorn picking up his 16th European Tour title. Ireland’s Shane Lowry, who carded a disappointing 73, led at the start thanks to Bjorn’s poor opening but he finished on eight under with England’s Luke Donald, a two-time winner of this tournament, one stroke ahead of him. Donald fired a fine 68 to be 10 under and the nearest challenger, and join Bjorn in the final group on Sunday. He birdied the final two holes while Northern Ireland’s Rory McIlroy is a shot further back after a 69. Heavy rain had delayed the start of the third round with the pairs becoming three-balls in order to get the round completed. Italy’s Franceso Molinari hit the lowest round of the day with a 65 but he’s still nine shots adrift of the leader. Email “Lowry and McIlroy lead the chase but Bjorn opens five-shot lead at Wentworth”. Feedback on “Lowry and McIlroy lead the chase but Bjorn opens five-shot lead at Wentworth”.